A mix of regal warmth and rustic country chic make our PIttsburg Bed a captivating centerpiece for any bedroom suite in the home. 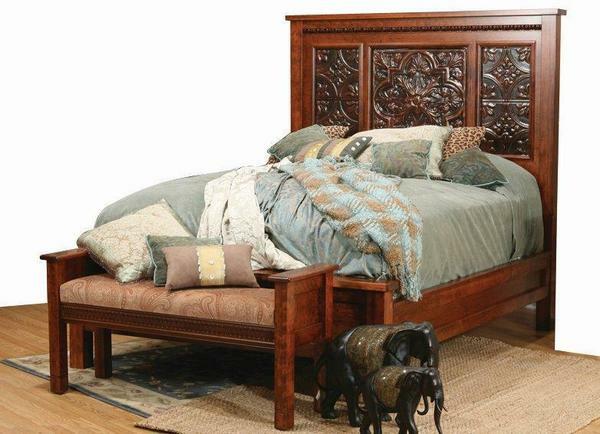 Some things never get old - which is evident in our charming Pittsburg Bed. With its tin panel headboard, ornate molding throughout, and large, bold lines throughout the legs and side rails, this country-chic look is sure to take center-stage in any ensemble. Crafted from solid hardwood, by the skilled hands of Amish artisans, you can count on generations of beauty and strength to provide a true family heirloom. Start by choosing the perfect size to fit your available space. From the space-saving, kid-friendly Twin, to the grand King for the master suite, we can construct this bed in any size you need. From there, choose from seven different wood species, each with a variety of stain options to choose from, creating an array of different tones that will allow you to match or complement your unique decor. Shown with Tin Panels, you can choose this beautiful detail for the final look, or choose a solid wood panel and get down to the exact look you want. Floor to Top: 17 3/4"